Have you noticed - Christmas is almost here! Time flies, doesn't it? And is it from the high speed of time or just the season but the weather is getting colder! That is why today, Kanelstrand paired with KnellyBean to give you a warm and soft cowl, to keep you cozily snuggled all winter! The KnellyBean shop is packed with beautiful colorful handmade accessories and supplies which I am sure you will fall in love with. And the greatest thing of all is that Erika - the crafter behind it - is a dreamer! I wish there were more dreamers out there making their dreams come true in such a vibrant way. Before I show you what we have up for grabs this week, let me tell you that Erika is offering a 10% discount to all Kanelstrand readers. Use code KANEL10 at checkout. I strongly recommend you to drop by her shop and chose some lovely handmade Christmas presents not only because the awesome cowls and accessories will blow your mind but also because the KnellyBean shop is donating a portion of the sales to the Scleroderma Foundation to help fund research and awareness of the disease. To learn more about Scleroderma, click here. 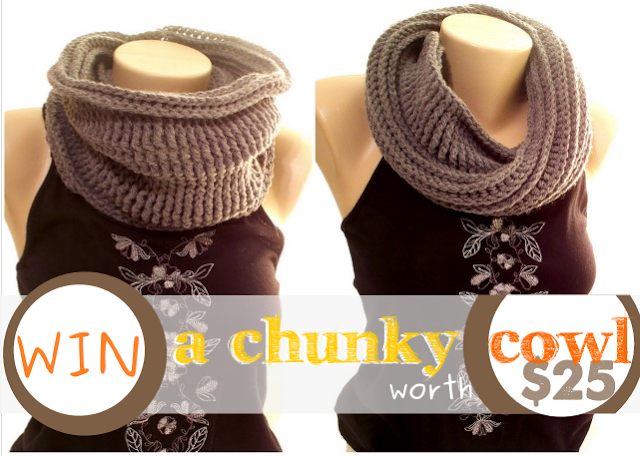 And, now, here is the beautiful, cozy cowl you can win this week! It is chunky, it is soft and it will definitely keep you warm! The pattern gives it extra thickness without making it heavy, and it can be reversed for a different pattern, when you feel like switching up your look. To enter, just follow the Rafflecopter widget! The Colorblock Cowl in Magenta and Charcoal Cotton Blend Crochet Neckwarmer is my favorite. <3 thanks for the chance! KnellyBean makes truely beautiful things!! "You may say I'm a dreamer/But I'm not the only one/I hope someday you will join us/And the world will be as one." And such a pretty cowl! Good luck, everyone! My favourite item is the Cozy Cowl in Pumpkin... so bright and happy! I LOVE The Chunky Cowl in Chartreuse!! AWESOME color! awe. I LOVE this cowl! I'd wear it all of the time! It looks so cozy and easy to wear. LOVE. WANT. I'm following YOU ;D.
I love the The Cotton Blend Cozy Cowl in Magenta. I like The Colorblock Cowl in Magenta and Charcoal Cotton Blend Crochet Neckwarmer. I love the The Chunky Cowl! I like The Colorblock Cowl in Magenta and Charcoal Cotton Blend Crochet Neckwarmer! I'm in looove with the Crochet Necklace in Neons - Hot Orange, Magenta, Lime Green, Black ! I really love the Crochet Cowl in Lavender Purple. I like the wool blend cozy cowl in mustard! What a cute shop, and a super cute give-away! Thank you! I love the cozy cowl in steel grey! So cute and looks very warm! I like the cozy cowl in magenta! I love the crochet starfish especially the natural colour ones. I thought they were the real thing when I glimpsed them on the page! i love the chunky charcoal grey cowl. thanks! Love that scarf! I've been wanting like it in a mustard or some other fun color! I love the gray cowl! so stylish! The rafflecopter would not let me enter text. I love the The Chunky Cowl in Gray Heather. I can't seem to find the answer anywhere so.. is this giveaway open worlwide? Yes, it is open Worldwide! The bad hair day berets are cute! My favourite item is the Crochet Cowl in Lavender Purple Merino Wool Blend Neckwarmer! I love the Rainbow Stripes Colorful Crochet Scarf for Child. I love the Color Block Cowl. It's adorable! !